HEBREW LETTER: Tav, a sign, mark, or cross: Both an elemental cross showing the occupation of the Elemental Kingdom (Malkuth), and an indication of one’s pledge, agreement, subscription, or commitment. CARD NAME: Through Tarot’s history, this Trump was usually called The World, though “world” was understood to mean “universe,” in the sense of the Latin mundus. That is, it means “all that there is,” and should not be delimited by time or space. Mundus has an unexpected history, which is worth symbolic reflection: As an ancient Mediterranean (probably Etruscan) root, it means a woman’s cosmetics! (The world – all that is – was anciently equated to a woman’s cosmetics.) Furthermore, the equivalent Greek word, kosmos, means both the universe and feminine adornment. This lends extraordinary insight into the design of the card and its symbolic meaning! ESOTERIC MEANING: The Serving (or Administrative) Consciousness. It directs the movements of the seven planets, each in its own proper course. TANTRIC & ALCHEMICAL SIGNIFICANCE: The Seal: Completion of the Work. The universe newly formulated and manifest. DIVINATION: The matter of the query itself. Synthesis, conclusion, the end of the matter. May mean delay, opposition, obstinacy, inertia, patience, perseverance, persistence through difficulty. The crystallization of the whole matter involved. Usually, as it denotes the actual subject of the query, it depends substantially on the accompanying cards. Found it virtually impossible to concentrate and be with the card tonight. Didn't "get" anything from the meditation. Perhaps that's the point. There's nothing to "get". This is IT. And it's perfect. The dancing princess-prince plays with the whirling serpent like a child playing with a new toy - gently guiding it along with her left hand. In her right hand she wields a hook to reap what she sows. I see two eyes in this picture - the one in the back of the card and turning the card sideways and look closely, there is another eye. This second eye is the eye of an enormous being, larger than we can even imagine. It beholds the dancing princess - prince like a parent watching a child play. Everything happening in the card seems to stem from the eye in the background, the sum of which becomes the eye we see when we turn the card sideways. Inner gaze directing outward - witnessing and outpouring one's Self out into the world of action. I feel like I am grasping at straws. The universe escapes me. Edit - just when I thought I didn't get much I take a quick glance at the image of the card that I posted in this thread that the huge eye is gazing at the dancing princess because it is looking at ITSELF. Like "look what I have become! I love myself"
The background (kerub wings?) actually appears to be a foreground. A frame. Reminiscent of anatomical drawings of muscle tissue. Vaginal muscles distended as they give birth to... what? This is the last image that a newly-born child will see of the higher realms before taking on her body of Guph. The ring of the zodiac holds the gate open and imprints itself on the child as it squeezes through. The blue-green moebius wants to be understood. To be untangled. It imprints itself on the mind as a mystery, calling out to it to find its way back. Not dissimilar to the lamppost in the wardrobe. Is she falling backwards? I've always assumed that she was dancing in ecstasy but she's looking quite unstable. If this image were in motion, I would expect the zodiac to be spinning like a buzzsaw, the eye to be blasting energy to all directions, the kerubs to be spewing water at reality eroding speeds, and the figure to be floating hopelessly backwards, adrift in the aethyr. - The egg of indigo is not that easy to form. All of the ideas from the card are bouncing around and want to assert themselves. I allow them to have their way but keep my intentional focus on visualizing indigo. Am able to find some stability in considering this hodge-podge to be the "Mechanics of the Universe" that I am witnessing as a direct instruction to me. Not dissimilar to the Oath of the Magister Templi. This is something that I instinctively rebel against though I can intellectually come to terms with it. That seems backwards but it is what is evident. How do I drop my barriers and trust that the Universe as I currently understand it is not the Universe as it actually works? - LATER: The figure in the card falling backwards might be the answer to this. It makes me uncomfortable because the breasts and curves are evident and immediately suggest to me that it is female but it is regularly written that male genitalia are hidden. Combine my physical discomfort with the hermaphrodite (despite my internal identification with hir) and the realization that s/he is tumbling backwards, out of control, giving hirself over to the energies of the Universe, and s/he seems to be a perfect cypher of what I need to do to myself. Time to step fully onto the flying snake of light and allow him to pull the rug out from under my feet. - There is no God but me and my lord Hadit. Nuit on a lower octave. - Indigo egg of light forms easily and vibrantly. Flowing liquid light at a very short wavelength. The night sky, black with just a tinge of midnight blue. Very solidifying. - The quadrangle behind the figure's head keeps calling out to be understood. I think it might be a highlight on the green-blue sphere but it's not forming well to my 3D vision. Might have to double check that on my next "enhanced" vision analysis of the cards. Suggests image of Mother Goddess with legs open, feeding the world with the waterfall emerging from her womb. This card is a close-up of that gate, the 4 kerubs spraying out the nourishing waters of the aethyr that keeps Malkuth alive. - Is this a sickle in woman’s hand? - The central space in the card resembles an egg. - Cross: place where the Rose blossoms; it’s the Two becoming Four, which is Five (point of intersection in the middle), and which, when perfected (balance is the key for this) is “united” with the Six, i.e. becomes its perfect Reflection or the “point of manifestation”; there is this deeper truth portrayed here, that the Fife is based on Six, not the other way around. - Color: this color is all-absorbent, it’s deep, I feel it’s the deepest color of all… it’s Space, Nuit, all phenomena that are characterized as never-ending and without-beginning. - The head of the virgin is up, and the head of the snake is pointed down, in their dance… Creation of the World… Aren't they One? The same force, in two directions. - She is free and pure; she dances with Kundalini; this is how Worlds are created – practical instruction for materialization of any Idea. - The four cherubic figures remind me of the four Royal stars, the stars regarded as “Guardians of Heaven” by the ancient (Aldebaran, Regulus, Antares and Fomalhaut). - 400: the Form is stable; it tends to rigidity; but it can be undone – although it seems not capable of this – by application of that same Force (interplay of principles) that created it. The secret that this card seems to portray is that the Subtle (“more-rarefied”) governs the rough, it’s the “hidden law” of how the mechanism of the World functions. - I look at this card today from the perspective that it represents the relationship of the Foundation (Yesod) and the Kingdom (Malkuth). - Cherubs are the Four, and “inside” is the Egg of Spirit. In this Egg of Spirit, the Virgin and the Snake are initiated (born, created) by the Eye which is Transcendent; the two polarities create in their dance all there is, the whole of the Universe, all the stars, constellations, etc. Their dance is not ordered by the laws that govern the created phenomena (manifested Universe), it is the manifestation of Creative Chaos, and although it takes various forms it is beyond forms, it’s the essence of the Creative Impulse, in everything that exists. - There is no law beyond Do what thou wilt! - This is Necessity – the Highest Necessity – all the other necessities stem out of this Freedom (we perceive them as specific laws for every particular Plane of Existence). Shakti in playful engagement with the cosmic serpent of Hadit. Body of Nuit is all pervasive around them. Like a ship in the midst of a starry vault, the eye of Ra travels over the dark vast emptiness bestowing his penetrating light. It is casting its solar rays upon Shakti and the cosmic serpent as they dance in sexual rapture and bliss – which is the very essence of the experience of being/existing. Wisdom which illuminates and liberates (serpent) is indivisible from bliss – as is also communicated in Tibetan Buddhist Tantras that speak of bliss and voidness as two inseparable qualities of the ultimate nature of reality. Voidness refers to lack of intrinsic existence, and the recognition of voidness as the ultimate nature of all things is the wisdom which enlightens the mind and transforms it into the Buddha mind. The sexual (creative and active quality of existence) connotation also comes from the presence of polarities – the feminine (Goddess) and the masculine (phallic serpent, with solar light shining upon him). All takes place inside the shape of the ultimate Yoni, the womb that gives birth to the universe, its galaxies, stars, and planets. The Yoni is that of the Great Mother, or Binah to whom Saturn is attributed – in addition to its attribution to the Universe card. In this context the imagery can also be seen from the perspective of being submerged in the deep primordial waters, and the Eye is shaped like a bottom of the ship up above. In this card I find it curious that air and water seem interchangeable so that the image might be taking place out in space, as well as under the water. The 4 Cherubim are expelling what seems to me like water (could be air too I suppose) from their orifices. I think this ambiguity is done on purpose, to further emphasize the presence of the Great Mother/Binah principle. The outline is that of Yoni, which might be a window into the Great Womb where all is formed - metaphorically. 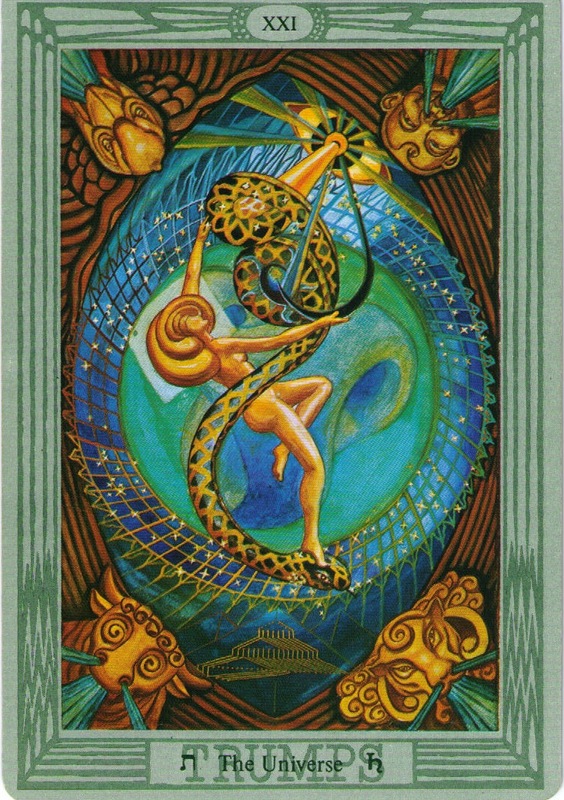 Shakti riding the serpent – she is directing the kundalini force – their intertwined bodies compose an infinity symbol – indicating the limitless capacity of the universal energy which they represent. Today my eye keeps on going to the architectural structure within the pyramid on the bottom of the card – makes me think of the following phrase “The Khabs is in the Khu, not the Khu in the Khabs”. I think because of this verse “…and Khabs is the name of my House” where Khabs is metaphorically referred to as the house. Hence I am seeing this structure as if the architectural structure might be representative of the Kingdom of God, and it is inside the pyramid form which is its outer form/shell – extending the metaphor to the impermanent shell/enclosure that is our human body and immortal and divine/spirit within it. In the universe card this further confirms the limitless/endless universal energy that is ever-more recycled unto itself (as waves rise and then crash back becoming again one with the ocean) – hence physical death is not the end but rather it signifies returning of the energy back to its source. The Universe is forever a living, moving phenomenon.